Healthy Tract™ Technology: A proprietary blend of select ingredients helps support urinary tract health by lowering pH levels and balancing calcium and phosphorous levels for optimum function in show goats on nutrient-rich show diets. Advanced amino acid profile: Multiple sources of protein, bypass amino acids and guaranteed amino acid levels help create a winning profile to support performance in heavily muscled goats, including muscle development and aiding growth in frame, bloom and body condition. Superior palatability: Innovative formula with superior palatability helps encourage consumption in young kids and helps keep goats on feed for proper intake levels and superior performance from start to finish. 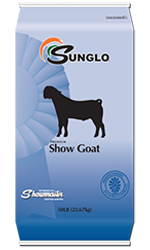 Performance-driven features: A powerful combination of added features promote superior performance in show goats, including Omega-3 fatty acids, added yeast culture, direct-fed microbials and organic trace mineral complexes of selenium, copper, zinc, manganese and cobalt. Active nutrient supply: Elevated nutrient levels, enhanced nutrient availability and superior overall nutritional balance promote unprecedented performance in show goats at every stage. Show micronutrients: Select micronutrients support strong bones, a healthy immune system and muscle mass found in superior show goats, including Vitamin E, Vitamin D, thiamine, biotin and minerals such as chromium, copper and zinc. Contains Deccoquinate at 9.1 mg/ lbs. A consumption of 2.5 pounds per 100 pounds body weight daily will provide the desired level of Deccoquinate. Feed for at least 28 days during periods of exposure or when experiences indicate that coccidiosis is likely to be a hazard.